This week has been full of debate over driverless cars. Oops — wrong future! says Google-Funded Pundit: Forget Transit, the Future Belongs to Robocars. But Driverless cars don't change geometry. On the other hand, students might--like South Brunswick High School Students Seek Sidewalk. 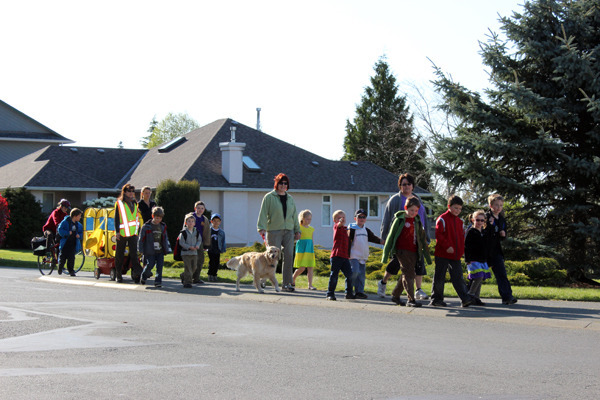 And it's a good thing, because this week we learned why Why Seniors, Children, and the Poor Are at Greater Risk of Traffic Deaths, which may explain why Some Comox Valley elementary students get aboard 'walking bus' to stay safe during their walk to school. Elsewhere in the country Five Points Officials Looking to Make Area Safer to Walk as well, while King County's 'Complete Streets' Hopes To Reverse Health Effects Of Sprawl, Washington-DC Area Planning Board Approves Complete Streets Policy and Essex County Complete Streets Policy Adopted. But it's not Complete Streets for everyone. Is the world's fastest pedestrian signal in downtown Muncie? I can't say, but I do know a "Diverging diamond" doesn't help make a walkable corridor. And those walkable corridors are important, since New housing forecast mostly good for walkable communities. And while we're talking about walkability, don't forget that Parks should be pedestrian friendly. So should bridges, like the Pedestrian bridge dedicated to long-time trail leader in Maine. And maybe even...Vegas? I guess it's one of those Walkable Places Where Glitz Is King. But cars are king in Kenya: Mwau's Car Knocks Pedestrian to Death, reminding us that the question of walking vs. driving is also one of who has the power. Finally this week, in California the Senate OKs bill to increase fines for cell phone use while driving-- but across the country they've taken the opposite approach: Texting while walking banned in N.J. town.